Should you put your IRA or 401(k) into your trust? This is a question that comes up frequently during the funding stage of a trust with a client. The answer is NO. The IRA custodian or 401(k) plan administrator will hopefully stop you in your tracks if you attempt to retitle your plan into the name of your revocable living trust. The Internal Revenue Service considers that changing the owner of your IRA or 401(k) even to the name of your trust is a 100-percent withdrawal from the account. You must report the entire value of the account on your tax return, and it will all be taxed as part of your income in the year in which you made the change. If you're younger than age 59 1/2, you'll also have to pay a 10 percent penalty for early withdrawal of the funds. Rather than changing the actual owner of your IRA or 401(k) from your name to that of your revocable living trust, you can change the primary and secondary beneficiaries to coincide with your estate-planning goals. This may appear to be a simple task at first glance, but depending on the size of your IRA or 401(k) and what your estate plan is, you might want to work with an experienced attorney. 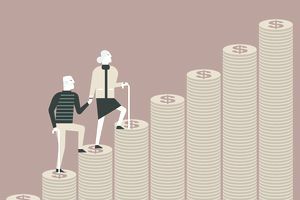 Naming your trust as the beneficiary of your retirement funds can also have negative consequences, but if you want the funds to go to your spouse, there's a way to do it while leaving your trust out of the equation. It can just deal with your other assets. Under special IRS rules, you can roll the retirement account over to your spouse, and she can then roll it over to younger heirs at the time of her death, using their dates of birth for required distributions and thus stretching tax consequences out for many more years, sometimes for generations. ERISA-qualified retirement plans are subject to many interacting and complicated rules, particularly when they are passed as inheritances. Certain actions you may take with them cannot later be undone if you realize you've made a mistake. It's extremely important to get expert advice before you act. *Note: State and local laws change frequently, and the above information may not reflect the most recent changes. Please consult with an attorney or an accountant for up-to-date advice. The information contained in this article is not legal or tax advice, and it is not a substitute for legal advice.